30 Pretty Tops You Won't *Believe* Are For Rs 300 Or Less!! Whether you’re a jeans kinda girl or someone who loves her maxi skirts, you’re probably always on the lookout for yet another cute top to pretty up your outfit… Well, look no further, for we’ve put together the prettiest ones we could find for you - and guess what? They’re super affordable too! 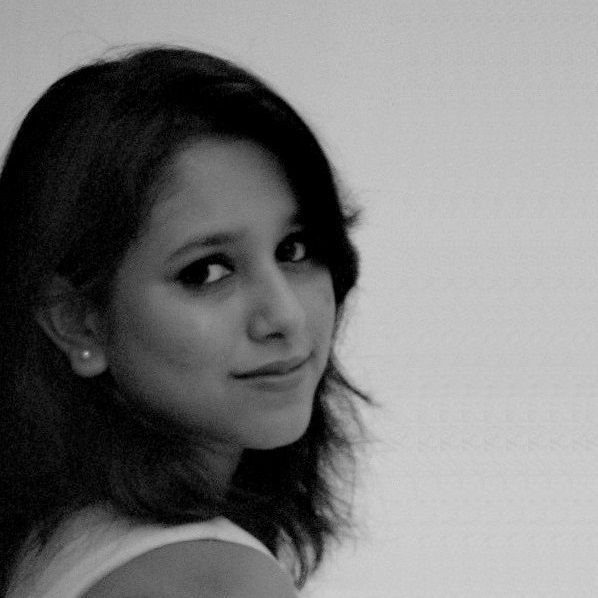 Here’s our list of the best tops for women under Rs 300 - go crazy! We absolutely adore this printed sleeveless number. The fuchsia panels provide just the right degree of contrast for the all-over print - and who doesn’t like a classic Mandarin collar being offset by a quirky high-low hem? Price: Rs 300. Buy it here. Give your white-tops wardrobe a makeover with this trendy number - we love the overlap-front detailing that makes this simple short-sleeve top really stand out. Price: Rs 300. Buy it here. 3. A ray of... rangoli! How cute is this bright and happy top? Pair this with either jeans or a solid coloured maxi skirt - all you need are some statement earrings and a chunky bracelet to turn heads. Price: Rs 299. Buy it here. Why opt for a basic tank when you can get this pretty little number instead? We love the print and the easy anti-fit silhouette. Price: Rs 300. Buy it here. Whoever said shirts were boring...was so wrong! 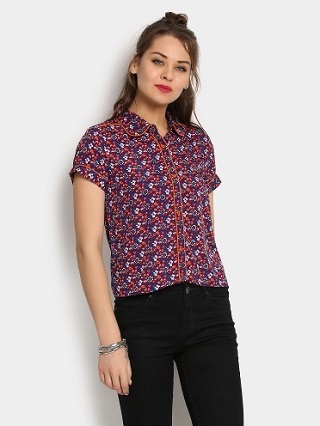 Just look at this adorable blue-and-red printed floral shirt - doesn’t it make you want to “add to bag” right now?! Price: Rs 278. Buy it here. This empire-waist black top is for those days when you have to go out but can’t be bothered to dress up. Just pair it with jeans, a maxi skirt or printed pants, throw on a chunky necklace, and you’re good to go! Price: Rs 299. Buy it here. A Mandarin collar giving way to a discreet little overlap front, finished off with adorable cap sleeves and a rounded hem - ladies, what’s NOT to love about this blue printed top? Price: Rs 300. Buy it here. A not-so-basic black top that would go perfectly with both trousers and skirts...and at that price? Hell yeah! Just slip on some chunky silver bracelets to be the ultimate party-starter! Price: Rs 300. Buy it here. It’s not green, it’s not blue - but rather a beautiful shade in-between mint and teal… Well, stop obsessing over the name of the colour and go buy it already! That structured high-waistline is too flattering to resist. Price: Rs 300. Buy it here. The classic paisley print gets a colourful makeover in this v-neck, full-sleeved blouse. We especially love how the olive green cuffs and the front placket balance out the print nicely, making this a great pick for both work and play! Price: Rs 299. Buy it here. 11. The cutest crop ever?! Say hello to this little top that’s making us smile just looking at it! The leheriya inspired print and easy fit are both adorable. Wear this on top of a white fitted cami if you don’t want to show too much tummy, but wear this you must! Price: Rs 299. Buy it here. 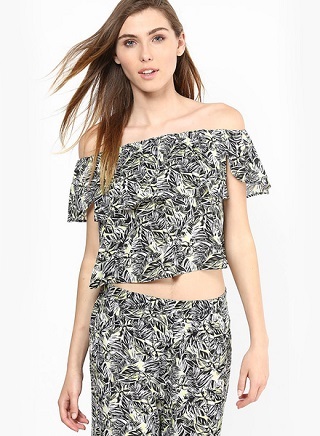 Why go the boring old solid-colour way while you’re picking a top when you can get a crazy printed one in monochrome?! Price: Rs 269. Buy it here. We’re not sure what we love more about this sleeveless top - the colour or the print! Pair this boat-neck top with white palazzos and silver jewellery for an effortlessly chic look. Price: Rs 280. Buy it here. 14. Ring in the festive season! Work in some ethnic charm to your daily-wear wardrobe with this little kurti top. With its super cute “ring” print, let this one be your saviour when you’re lounging at home and unexpected guests show up with a mithai ka dabba! Price: Rs 299. Buy it here. 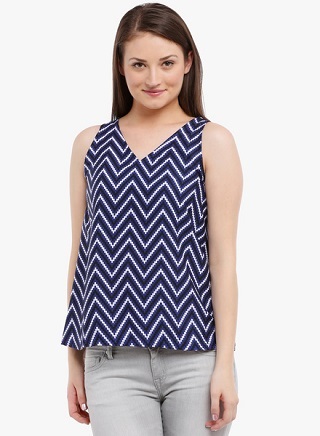 Words cannot express how much we adore this rich indigo sleeveless top. And thanks to the white-and-blue chevron pattern, this one looks so edgy yet ethnic! Price: Rs 299. Buy it here. Be bold, be striped! 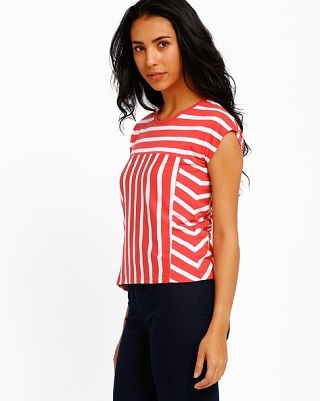 The combination of horizontal as well as vertical stripes in red-and-white make this one a helluva statement top indeed! Perfect for college and Casual Fridays in office, we think. Price: Rs 279. Buy it here. An off-shoulder crop top is a bold choice, sure, but how can we resist the monochrome print and the uber-feminine ruffles? Buy this - buy this now! Price: Rs 300. Buy it here. This one’s for the girl who likes a hint of quirk in her daily style. Pick up this fuchsia top with its all-over scooter print and zoom cheerfully through your day! Price: Rs 250. Buy it here. This high-neck, cap-sleeve top is pretty regal to look at, wouldn’t you say? 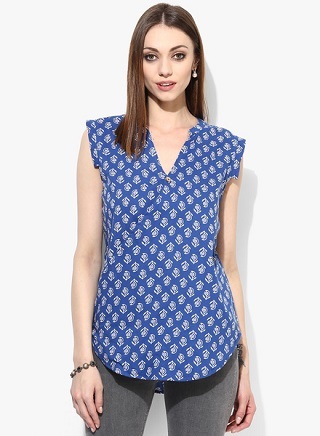 Look like the queen that you are in this majestic blue top with the delicate floral pattern! Price: Rs 284. Buy it here. We love, love, love the combination of colours on this kurti. Wear this comfortable cotton number to make your day feel happier and brighter! Price: Rs 299. Buy it here. How pretty is this mint and navy colour-blocked top with the asymmetrical hem? With its very ethnic-vibe print on the front, this is a perfect and comfy daywear option for the festive season. All you need are jeggings and a chunky bracelet for your wrist! Price: Rs 279. Buy it here. Who can resist a hint of peach in her wardrobe? Especially when it comes in a layered top that can add a dollop of sophistication to your look? We sure can’t! Price: Rs 279. Buy it here. This one’s for the girl who likes her style a little different from everyone else’s - and we absolutely adore the side tie-ups on this little black top! Price: Rs 300. Buy it here. 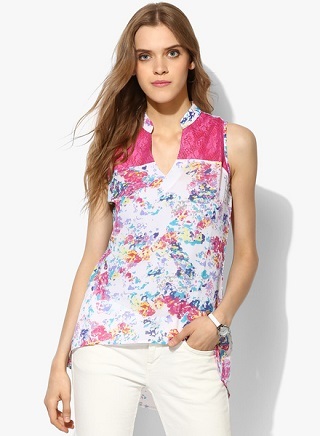 Layer this pretty printed top over a fitted cami to rock the sheer trend without worrying about looking risque. And isn’t that print incredibly pretty? Price: Rs 279. Buy it here. One to add to your basics collection. 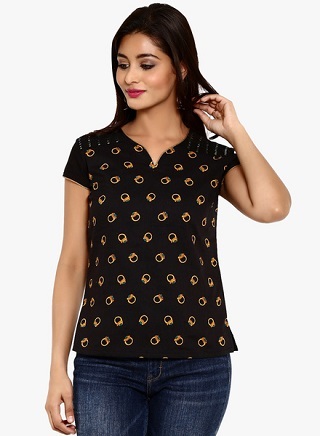 This black and white printed top is the perfect option to slip into and pair with jeans or a black maxi skirt for those days when you want comfort more than anything else. Price: Rs 284. Buy it here. This beautiful blue crop top is for the girl who loves her fabrics lacy! “Holy Chic” says the top - we totally agree! Price: Rs 278. Buy it here. Remember Sonam's awesome crop top in "Abhi Toh Party Shuru Hui Hai"? Then it's time to channel your inner Bollywood star with this super cute crop! Wear it as a top or as a blouse for a saree - this is one helluva versatile number! Price: Rs 300. Buy it here. For those days when you want to add a touch of colour to your look without going too loud or bright - this comfy sleeveless shirt is a perfect pick! Price: Rs 298. Buy it here. This three-quarter sleeved top is perfect for adding a touch of dressiness to even your basic black pants. Pair this with silver statement earrings and be ready to make an understated, effortless style statement. Call us old-fashioned, but we do have some major love for this retro (yet classic!) trend - we can never have too many polka-dotted clothes in our wardrobes! And this sheer one is simply too cute to resist, wouldn’t you say? Price: Rs 278. Buy it here. Happy shopping, ladies!